All men are created equal. Nothing symbolizes this idea more, we believe, than this insignia.We say, lets rally behind that idea.This is more than just a buckle & belt. It is more, a spirit, an ideal, a goal, the kind of item we just love. Show your pride in the Union of The United States of America. Before the Civil War we as Americans referred our country as the United States are a group of States. After the Civil War ,we curiously began referring to ourselves as the United States is.... The civil war made us an is. It must be further noted that every state in the south sent companies of men to fight for the union. This belt is made by us with a no maintenance(no polishing necessary) buckle that is not only 'eye-catching' but sized to be more contemporary. The originals were quite large, this replica is the same size as modern buckle go, so there is no imbalance. 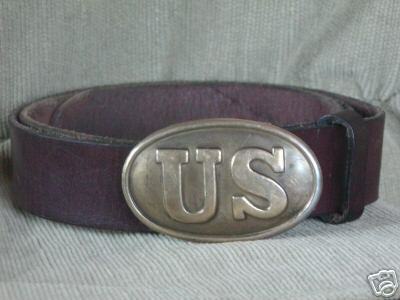 AS A RESULT, THIS IS A BELT, GREAT FOR EVERYDAY WEAR. RaFael - Kazakhstan. A very nice belt. I simply love it!